The Veterans History Project held its annual Congressional Staff Briefing to train those who work in the officers of Members of Congress on how to get their constituents involved with VHP, and to provide best practices for running successful, customized VHP activities through their district and state offices. Library of Congress, May 8, 2015. 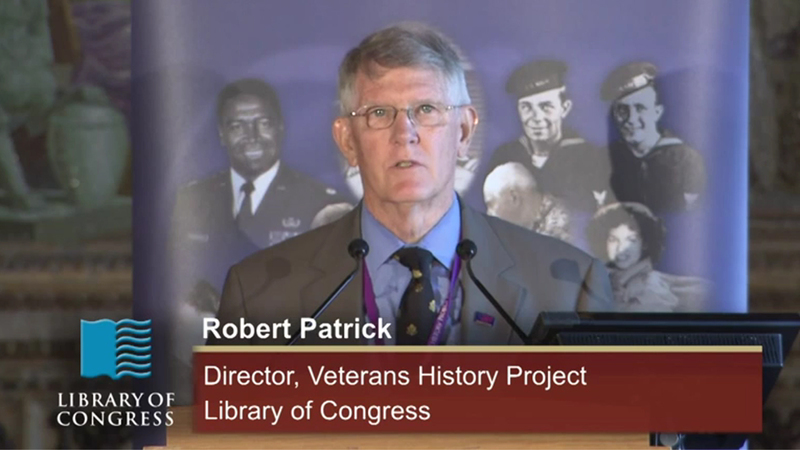 > From the Library of Congress in Washington, D.C.
> Bob Patrick: Good morning. I’ve gotten around, I’ve met a lot of you. If you haven’t met you yet, I’m Bob Patrick. I’m the director of the Veterans History Project here at the Library of Congress which is a part of the American Folklife Center, and, without any further ado, I’d like to introduce the director of the American Folklife Center, Dr. Betsy Peterson. > Betsy Peterson: Good morning, everyone. As Bob said, my name is Betsy Peterson. I’m the director of the American Folklife Center here at the Library of Congress, and, on behalf of the Folklife Center at VHP, I want to welcome you here this morning especially on this beautiful day in the commemoration of, 70th commemoration of VE Day. But for those of you who don’t know anything about the American Folklife Center, which I have a feeling might be a few of you, we are the umbrella partner for the Veterans History Project, and I’d like to give you just a little thumbnail sketch about some of the work we do because there’s incredible synergy between VHP and AFC, as we call it. The American Folklife Center was established by an act of Congress in 1976 with a mandate to preserve and present the rich and diverse folklife in the United States and beyond, and we do that in a range of ways. Our archive, however, actually predates us and goes all the way back to 1928, and, since that time, as you can imagine, has grown to be the nation’s and, perhaps, the world’s largest repository of folk culture, folk traditions, documentation, other materials, photographs, interviews, manuscripts and the like. And we can help your constituents and do help your constituents in many ways, and we can help your member’s office in many ways. First of all, we are a resource for your constituents. People come to see us every day, every week. We are dealing with individual questions and queries online all of the time, and I want to encourage you to encourage your constituents to get in touch with us. We are a great resource of information. We also are a great resource of information for oral history or folklore training. Learning how to do the documentation and the interviews, working with constituents and, in fact, two of our staff are leaving this weekend to go to Utah to do one of those trainings. We also work with state folklore, state arts councils, folklife departments that may exist in your state. We often work with state humanities councils. So we are constantly engaged in a lot of the folklife work that is going on in your state, and we are a resource for Congress. Please, feel free. Our door is open always to help you with any queries or questions that you may have in the work that you do. We also, I think most critically in that regard, have a page on our website called Folklife in Your State. Just go to the homepage and you’ll see that on the left hand side, click on it. It will give you a bibliography, a finding aid, of all of the collections about your state in our archive. It will also give you a list of resources about folklife programs, activities, university archives in your state. So, please, check that out, and if you have any questions, let me know. But given that little background sketch, I hope you get the sense or understand that VHP is a very fitting partner for the American Folklife Center, and VHP is why we’re here today. You know, there’s a common refrain in the news and on the media, I think a lot these days, about the 1 percent who serve and just the perception that veterans are becoming more and more removed from the mainstream life of American citizens. But according to a relatively recent Pew research survey, I believe last fall, 61 percent of Americans have an immediate family member who has served in the U.S. Armed Forces, and the survey defines immediate family, as you would imagine, a spouse, as parents, siblings, children. Not accounted for in that survey are the larger still percentages of aunts, uncles, cousins, nephews, nieces, and the like. So the likelihood that a vast majority of people have a veteran in their life, or, certainly, in their communities is obviously quite high. I, myself, count a grandfather, father, numerous uncles, brothers, nephews, cousins, veterans of five wars in my life, and I’m sure you all have similar experiences. But I think the Veterans History Project counters that perception and — or, actually, I should say the stories in the Veterans History Project archive counter that notion. They bridge the gap in understanding about the human experience of war, and they put a human face on our ideas and our notions about America in conflict or at conflict. And it can be easily down with just a 30 minute interview. I know it’s a little bit more difficult than it sounds, but it really is just a one on one conversation helping to gather original material such as photos, letters, and diaries as well as those conversations so that people now and in the future can hear those stories. The collections we use every week, they are — people come to the American Folklife Center reading room to use Veteran History Project collections, but we serve everyone from fifth graders in Alaska to postdoctoral researchers in Florida. Family members seeking to understand more about a loved one that has passed or that is a part of the current member of their family. To staff of members of congress seeking to inform their boss prior to meetings with their constituents. So there’s a range of ways to use this material, and we look forward to working with you over the coming year and in the years to come to insure that your state, your constituents, your offices are well represented in our collections. We’re here to serve you, and, so, I’m going to turn things over to Bob Patrick now who is going to talk a little bit more about that and other things. So, thank you very much. > Bob Patrick: Thank you very much, Betsy. I appreciate that. Let me give you a quote. It’s a quote by Maya Angelou, and she said, “There’s no greater agony than bearing an untold story,” and the veterans that we just talked about, the veterans that Betsy was alluding to, carry those stories, and, in many cases, they haven’t told those stories. That’s why we always go around and talk to people also about who’s the veteran in your life, I’ve asked a few of you of you here this morning that, and have you heard their story. And that’s the purpose of this project. To reach out to the some 17 million living wartime veterans and 23 million veterans et al. who are in this country and, hopefully, to hear those stories, capture that information, and archive it here at the Library of Congress. The Veterans History Project is your opportunity to make a meaningful difference for your constituency. This project was created unanimously by Congress back in 2000 with the purpose of collecting, preserving, and making accessible the memories of America’s veterans. So, that, we hear directly from them and capture what we call the human experience of war. We don’t try to prove or disprove history, but, rather, to catch the thoughts, the emotions, the remembrances that veterans have about what it was like to serve in our nation’s military. Now, what does that mean for you? What it means for you is that you have a nationally important, emotionally significant effort that you can bring to your community. And it isn’t just, we also like to emphasize, it isn’t just you alone. It isn’t just the members of your staff back in the states alone. There are volunteer organizations, individuals, who are working throughout this country capturing these interviews already. We’ve been doing this for 15 years. We rely on volunteer organizations, institutions, individuals to do this. People like the Veteran Service, Veteran Services Organizations, American Legion, VFW, DAV, who I think we all know about. The Department of Veterans Affairs, educational institutions, Red Cross, Daughters of the American Revolution, I can go on and on and on. Retirement communities, hospice, the National Court Reporters, which we can inform you about which has been a great asset for us. But all of these are institutions that are right now collecting this information and sharing it back here to the Library of Congress, and we can tell you, within your office, how you can connect with them. We now have a collection of over 96,000. We get approximately a hundred new collections in every week that come. They are, again, as was mentioned by Betsy, archived here, made accessible for researchers, educators, or individuals who want to come in here and use it. They display a tremendous amount of information. They are diverse. They cover everything from World War I all the way up to the current conflicts of today. They are a very rich archive, not just with the oral history, but a lot of the original materials, photographs, letters, and diaries that stand behind them. My staff is here today. Would the VHP staff who is here today, please, kind of raise your hand, if you haven’t seen them already? They’re all sitting in the back, too. [Laughs] Like everybody else. They are here today to answer your questions and provide you with information. More importantly, they are on call to offer you a 15 minute session in your office to help tailor this process for your office, for your district, for your state. This isn’t a one size fits all project. We have offices in here already who have participating this project, and we’d like to sit down with you and see what works best for you. Today, you’re going to hear about a successful program from one of your colleagues. You’re going to learn more about collaborations that are easily achieved around this school as we share some of the unique efforts that are taking place now with an organization, The National Endowment For the Humanities, and then some of my staff are going to present you with some of the tools that are available to you right now that, through media, that we have made available. But when we meet with you, as I said, we will sit down with you and kind of provide a kind of a tailored approach for your own office. As Betsy mentioned, today is VE Day. I am wearing my dad’s World War II dog tag this morning because I know what he was feeling 70 years ago today over in Germany when he was serving. And if you think about, there’s a — if you know about World War II veterans, and I’m sure you’ve seen some in your communities, they’re becoming a diminishing demographic. There’s less than a million World War II veterans in this country right now. So it’ll be 150,000 by the latest estimate I have. They’re carrying stories that we need to get right now that are important for this archive but also important for the nation. And to honor their legacy today, there’s going to be a ceremony at the World War II Memorial that starts at, about ten minutes. But if you haven’t heard it yet, if you haven’t, if you haven’t heard it, you aren’t in any kind of social media, there’s going to be a flyover that’s going to take place come up the mall here and come right up here to the capitol and make a right hand turn back over that way. Be prime viewing up here on Capitol Hill, but we’ve got an offer for you folks who are here today. As a little bit of an ice breaker, we have some limited space available up in the librarian’s office which is on the 6th floor of the Madison Building, and, if you’re interested in perhaps doing that, we have a limited number of spaces but as you leave today, check in the back with one of the staff, Monica, or some of the staff back there. And if you’d like to show up there at noontime, we might be able to accommodate you, so that’s your reason for sticking around, too, right? [Laughs] Maya Angelou also said, “I’ve learned that people will forget what you said. People will forget what you did. But people will never forget how you made them feel.” This project is the ideal vehicle for connecting your office to an effort that makes people feel honored, feel valued, and feel like they’re make a positive contribution to the country. Which when we talk to veterans, we tell them, “You know, you’re performing another patriotic act for your country when you give your interview to the Veterans History Project.” But as I mentioned before, you don’t have to do this alone. You’re working together, I said, with elements of your community. People who are already involved with it. People who know about it but just need you to kind of give them some guidance, some materials, and maybe some additional support in what they’re up to. This is our 15th year in recognizing veterans and as well as our 15 year in recruiting interviewers, and we’ve made this 2015 a year of the interviewer the thank those, you know, I said there are 17 million veterans. Veterans aren’t the issue. There are veterans out there. The challenge is finding people to interview these veterans. We want to, this year, recognize those who have done so. I want to read you something. It may take a couple of minutes for me to do this. But it kind of gives you an idea of how this project can affect people in your community and the impact it has on them. I was out in Long Beach, California a couple of weeks ago, and I met this young lady. And we asked her if she could give us a quote on what it’s like for her to work for the Veterans History Project. Her name is Heddle Shaw. She’s 19 years old, and she wrote this as a part of her college application. If you bear with me, I’d like to read this. Quote “Patrolling the grounds of the U.S. military base in Japan, I put my hand on my holster. Quickly darting towards the faint noise I hear behind the tent. As I round the corner, I gape the imagine in front of me. A Japanese man with his hands wrapped around his skeletal body, scavenging an empty trash can for a few crumbs of food. I withdraw my gun, aim it at the man. I hear orders in my head from my commanding officer directing me the shoot any Japanese person on site. But then I watch a fellow human jerk, still, when he sees my raised gun. He cautiously holds out his hands in the universal sign of hunger. In frustration, I feel myself shivering, but I cannot shoot him. Instead, I reach into my pocket, take out an orange, and put it into his hands. The man falls to my feet overwhelmingly grateful for my legal actions.” Unquote. Heddle writes, “This is the story I recall as I look down at the body of Howard Keenan, the brave World War II soldier who chose to share an orange rather than shoot a man. Three months after I interviewed Howard for the Veterans History Project, he passed away from a stroke. I put my hand on his glass coffin, knowing that an honorable man died when Howard’s heart gave out. As the number of interviews I have conducted increases, I have heard countless stories of people choosing the humane over the over authorities orders. Each story makes me realize that humanity triumphs even in the most battle hardened soldiers. Coming from a community that cares about reputation, more about reputation than morals, the stories from VHP pierce my heart. These stories make me painfully aware of how my community lacks what, in my mind, made Howard a hero. Rather than coming up with ideas to address their issues, my town drops homeless off outside city limits. Instead of assisting bully victims, my school refuses to acknowledge that bullying is occurring because it ruins their public imagine. Even my parents tell me that since the world values individual success, I should not let my inclination or humanitarianism become impediment to my success. Surrounded by people who lack concern for others I needed to find my faith in humanity again. Participation in the Veterans History Project restored that faith. Made me realize that it is important to do the right thing even when it may be detrimental to my personal record. Through my involvement in VHP by the American Red Cross, I have realize that not everyone is like my parents, community, and school. I’ve realized that there are people in this world who have the courage to follow their passion, even when society tells them their goals are trivial. My dream in life is to motivate others to always stand up for their belief. Even when all the, all of society claims that they are wrong.” That’s what this project can do. That’s what this project does every day. Not just to young people but also to veterans who feel honored and valued by the fact we ask them about their story. It is now my privilege to introduce a gentleman who has come for us all the way from Nebraska, who has been working through Senator Deb Fischer’s office and her predecessor, Senator Mike Johanns. I feel it’s important I introduce Roger a little bit. Roger Lempke is a graduate of the United States Air Force Academy, class of ’69. He has also gotten a degree through the Air Force Institute of Technology. He served in the military from 1969 to 2007. As a senior pilot and qualified instructor, he is also the former Adjutant General for the state of Nebraska. He is a retired Major General in the United States Air Force, I assume, and it is with great pleasure that I introduce Roger. He has been very active in the state of Nebraska in transitioning the Veterans History Project but also being involved with it as well. So, without further ado, Roger Lempke. > Roger Lempke: Thank you. Thank you very much, Bob. It’s my pleasure to be here today. I’ve got to back this story up just a little bit since we’re about stories today. My dad flew C 47’s over D Day and then on into Europe. The major battle that they supported was the Battle of the Bulge. My mom is English. So I’m the product of a wartime marriage, if you will. She served in the rural Air Force, and she was, basically, a plotter. When you see the movies of them, of the English women, primarily, they were moving aircraft around on a big board during the battle of Britain, that’s what Mom was doing. So I’ve got a long background with regard to our military and history. We’re going to do a little bit of a PowerPoint here today to kind of talk to you about picking up and getting started and getting active in a Veterans History Project within a congressional office. First, let me ask. How many of you here are here from congressional offices? Most everybody? Raise your hands. Yup. Pretty much. Okay. So, how many of you, offices, do not do Veterans History Project yet? Are new to the process? Okay. Very good. So, the rest of you, how many of you are, the rest of you are doing project, raise your hand. Some are. Yep. Okay. Very good. We’re going to be talking this morning about transition and the key things you need to know about really getting a program going. It’s not a natural thing. I can imagine one day, your chief of staff walking up to somebody and saying, “The boss wants to do this Veterans History Project thing. It sounds kind of cool. We need to get it going.” So, that’s what we’re going to talk about it. How do we get this thing going, and how do we get it to work? Now, how do I get this to work? Here we go. We’ll talk about the process, in general, but I’m going to cover some specific areas of the process very specifically this morning. We’re going to talk about the technical pieces of this which can be the most difficult part of a successful program. You think today with all the mass media and the media and social media and everybody walking around with a phone in their hand that all this stuff would come naturally, but I find that it really doesn’t. You’ve got to work at making sure the technology’s right so that these interviews don’t fail. Then we’re going to go into interviewing, just a very little bit to highlight a few points and then, of course, as with most things that are governmental, the paperwork. There we go. I break it down into six major steps of the process. Some sort of interviewer training, and that may be somebody within your office that’s doing interviews or you may enlist people from outside. When I was with Johanns, we went out and did some training sessions with folks out in different communities throughout the state to get them involved in doing the interviews. Quite frankly, we didn’t get a lot of output from that ourselves. Not that you won’t in your particular state or district. What we ended up doing was more internal training within our office so that our staff could do effective interviews. Linkage, finding the veteran’s interview, I’m not going to spend any time on that. You all do outreach. You all have a database you do outreach with. The big thing is just to identify the Veterans History Project in your database, so, when you get names, you can put them in the database and you can work the connections to get them going to get interviews scheduled. What I am going to focus on today are organizing the interview, the preparation for the interview, the interview itself a bit, and then, finally, the package submission. Just, first, a general discussion on the commitment. What it takes to get a good interview period done, and let’s say you want to go out and do a day and do some interviews. You’re going to a nursing home. You’ve got a series of World War II veterans there that you can interview. Typically, if you can do six in a day, that’s pretty good. You got to figure probably an hour and a half, two hours, between, for an interview, the prep time and everything. It’s going to probably take you a good day to set up in terms of finding a location. You need to visit, and we’ll talk about that a little bit later. You need to coordinate the schedules of all those that are going to be participating. You need to follow up with the clients, and, of course, as some of you know, there’s paperwork. There’s a bio and a release form and sometimes it’s tough getting that stuff back. It takes a couple, three, phone calls to get all that to happen. So make sure that you allow someone in the office, whoever’s doing this, enough time to set up and organize a day of interviews if you do it that way. And then just to prepare for the interview itself. Interviews for six a day is probably going to take you a day or so. You need to really understand the conflict period that you’re going to be covering. Whether it’s Europe and World War II, Pacific, then you talk Vietnam, perhaps, and so forth. So you need to have a little bit of background or whoever’s going to be doing the interview about the period where these veterans served. Then you need to study the individual biographies that they submit, so, again, you get some idea of where they were, what they were doing, so you’re prepared to ask good questions when you get to that period. And then, when you get everything all collected, you probably got a couple of days of putting a package together. You do a time hack where you go through and listen to the interview and you catch little points in there so you put a time hack together so the future is starting to come back and pinpoint a spot in the interview, for example. So, my point in bringing this up is that make sure that you’re willing to commit the resources within the office or in support of the office to do this because this is what it will take to do one day’s worth of interviews and get them submitted. So, some general questions for the office, for your chief of staff, if you will. Who’s going to do the planning? In other words, who are you going to do outreach to, and who are you going to try to set up a schedule with? The locations. Who’s going to do that within the office? Who’s going to do the interviews? Are you going to have staff members doing it from within the state? Are you going to try to enlist others? It was mentioned, the connection with colleges can be very good. Student projects and stuff can be helpful. You can reach out to your local veteran’s organizations, but you’ve got — that’s work that’s got to be done by somebody within the office in order to make those things happen. And then who’s going to do the paperwork? Well, we’ve taught in the state of Nebraska, we’ve taught our interns to do the paperwork. So as soon as we get a new intern in, one of the first things we do is get them to sit down and go through all the stuff that has to be done once the VHP project package is to us. So those are general things you need to make, you need to iron out as a staff to move forward. I’m not going to spend much time on the field kit. The main reason I put this slide up is just to point out that, I guess, maybe, thanks to Bob here, this is probably one of the best sets of instructions I’ve ever read. It’s concise, and every time you go back and you’ve got a question, if you read through that thing you’re probably going to find the answer. I will admit when I started with Johanns and this started up in scanning the field kit, if you will, and I got in a few things on it, and, then, admittedly, after we made a few mistakes, going back, and reading it more thoroughly, and realizing that, yup, by gosh, it covered most of the things that I really needed to know. So, make sure you put the time into reading that thing thoroughly. It will tell you who’s eligible. That’s important because not every veteran is necessarily eligible for the, for submission. It will tell you about the accepted media and format standards. Not so much of an issue anymore as it was a number of years ago when we had some cassettes and things like that. Most of these things are digital today. The documents and photographs that tells you how to handle those and what’s acceptable and what’s not. And these are things you want to know before you interview the veterans, not finding out later that, sorry, this copy of this picture, sorry, we can’t submit it. So you need to know these things ahead of time. Preparation and interview tips. It tells you how to prepare for the interviews along with some of the things I’m going to tell you this morning. Processing the package, which, again, take some time and then a required form. So make sure you spend some time early on reading and understanding everything that’s in that field kit. Ah, equipment. And you would think, well, ought to be simple. Again, everybody’s walking around today with a phone and you got a camera on your phone and everything like that. Boy, this ought to be a breeze, but, really, the technical piece of this can be pretty daunting. Think about it. You’ve got a 92 year old veteran, which as the example was given here, three months after the interview passed away. So you have one chance in most of these to get them right. If you do the whole thing and find out that something was wrong, you were bleached out because they’re in a back against the window and the sun came out and you can’t see them or it turns out that the camera you’re using, the sound doesn’t pick up as good as you thought and you can’t hear them, you’re probably not going to recover that stuff. So you’ve got to make sure the set up and everything is absolutely correct when you do it. So, some tips on equipment, and, one thing before I go into that, when you go from one office to the next, if you are able to connect with a leaving office in your new office, you might talk about the transfer of that equipment through the, in our case, I’m familiar with the senate, through the senate office, to make sure that you can pick up the equipment they’ve used and continue to use it, or you may end up getting some equipment of your own. First, make sure the equipment’s easy to operate. So, the press shop equipment may or may not be the stuff you want to use. If it’s got a lot of fancy ways of adjusting the camera and so forth and so on which are, takes you some time to learn, you might want to shy away from that. Make sure you’ve got a microphone connection. Most of your equipment’s pretty good but having your phone and hoping that it’ll, that little mike on your phone will pick up somebody that’s five, six, seven foot away, it’s a risk. So always use a piece of equipment that’s got a plug in, and you’ve got a mike and a subject, most importantly. It’s got to be mountable, so you’ve got to be able — generally, we set it on a table, and then there’s a chair and so you can use just a tiny little mount, but you can’t sit there and expect to hold it for 45 minutes or an hour and have a quality input. And then make sure you got sufficient memory. I had one example where I just started interview, thank goodness I just started it, and the camera I had, because I had it so full, ran out of memory. That’s one of those, thank goodness, we were just into it so we can start over and we didn’t miss anything. So those are just things that can happen to you technically. If you’re a senator and you’ve got a large state, you may want to position equipment in different locations in the state. When I was with Johanns, we had about three sets of equipment that we had. We had some for Lincoln in Omaha, some for Grand Island which is in the middle of the state, and then some in Scottsbluff which is the western part of Nebraska, to use. And then you have to make a decision. If you use other parties to help you with these interviews, are you going to loan equipment out? Now, we didn’t typically. Again, you know, if you loan it out and you lose it, then you’ve got to go through all the paperwork of lost government equipment. But one of the biggest problems that people typically have in getting into this business, if you will, is actually having the right kind of equipment and having it and owning it, if you will. So you’ve got to decide how you’re going to allocate your equipment, especially if you’re in a large, large state. I mentioned the Kodak Zi8, which, by the way, you can’t buy anymore. It’s a tiny camera. It’s about that big. It looks a lot like a flip and some of you are familiar with the flip, maybe. But it had, it is attachable and it had a mike connection, and it was very easy to operate. So it was — I could put it in a very small bag, and we could keep it in the office and we could set it up very, very well. Unfortunately, they don’t make exactly this piece anymore but you can find, use that as example when you’re looking for equipment. Something like this will cost the office anywhere from 200 to $400 to it to buy, and that doesn’t include the mike which, again, is that much more. Don’t forget the technical piece because, again, that can be, that can cause as much, cause you as many problems as any other aspect of the interview process. The location, recon, which stands for reconnaissance. Make sure that whenever you set up a location, you go visit it to see what you’ve got. Here’s the things that you need. You need to have a quiet room and, basically, appliance and your air conditioner and heater system. Not noisy, and you need to really check it out. It’s terrible to be in the middle of an interview, and then, suddenly, this blast comes on, and, suddenly, now you can’t hear anything. So make sure you check out the location that you’re going to be doing the interview in so it’s set up properly. Make sure that it’s protected in a way from pedestrian traffic, vehicle traffic, and so forth. You don’t want somebody to open the door and poking their head in. So you’re going to be far enough away to do that. You don’t want to hear phones. So that could mean not only a phone from within the facility, within the room, but also phones from the surrounding office and so forth and so on. So pick a spot that’s quiet. Some libraries has separate rooms. I find those to be great. If you go to a rest home or to assisted living, often times they’ll have small rooms that are available. I don’t recommend an office in my way, shape, or form because it’s almost impossible to turn off phones. I would think twice about doing it at home, unless you can do it in a kitchen with a table with a standup chair. Lighting, artificial lighting is the safest. So we’re going to talk about lighting, it’s important enough we’re going to talk about it in another slide. And then, finally, you want a fixed seat for the veteran; i.e. you don’t want him sitting on a semi reclining couch, leaning back. You want him in an upright chair that isn’t swivel and moving and so forth. You’re going to have them boxed in on the camera for 30 to 90 minutes, and you’ve to make sure that their normal movements will keep their body, if you will, blocked on that camera. So get them in an upright, stationary chair for the, for the interview. Lighting, again, this can ruin an interview about as much as anything else. Either all artificial inside a room with the blinds drawn or all natural. I don’t recommend all natural. Right in the middle of the interview, a big cloud comes over and changes your entire lighting sequence and you’re sunk. So I highly recommend artificial lighting. Pull the blinds shut, make sure their back isn’t against lighting, which could skew the camera and so forth. You can control artificial lighting. Normally, house lighting is fine, so you don’t need to do any special lights and things like that for a close up type interview. Make sure that you don’t have lamps and so forth behind the subject that, again, will kind of blot out or make the view of the individual difficult to see. A lot of time, quality time needs to be put into the preinterview preparation. You need to spend some time studying the veteran’s biography. You need to study the wartime period. In the both, Johanns office and in the Fischer’s office, a lot of — some of our interviews are done by our staff members who have no military background, whatsoever, and then we’ve had some interns that we’ve trained to do it, and I do some myself. I’m a history buff, so if I walk up to a World War II veteran, my first question is, European or Pacific? Right away that narrows things real quick. European, when did you arrive somewhere? Well, I got there in England in 1943. Ah, D Day, and potential of moving over D Day. Or if it was ’42, chances are they wound up in Africa. So, those are things that you’ve got to know. Same thing with Vietnam. Where were you in Vietnam? So you need to study before you go into the interview so you know the kinds of questions to ask during the interview. Know about their youth period. Why they joined. If you were a member of the depression or coming out of the ’60s or the ’90s, the life decisions that you were making that caused you to go in the military were all different. The interview itself, make sure — there’s a recording that you do, it’s spelled out in the field kit, make sure that you identify who you are and where you’re at and so forth and so on. A brief personal background from the individual is helpful. Where they grew up. Their high school periods. How they got into the service, to personalize them and then the questions on the topic. When? How? Why? And follow up questions. Most veterans are not natural story tellers. If you don’t poke for that little bit of information that’s valuable about their personal experience, it may not come out. And that’s what you’ve got to train your interviewers to do. And then make sure you ask the veterans how to assess their experience, their personal experience. And if you have military jargon, explain what it is. I’m going to let you read this real quick. “This is what we did in darkness, wet, and discomfort. But a night spent in pouring rain, sitting up to the hips in muddy water with bits of straw hanging about him does make a man feel and look queer on first rising. Indeed, it was almost ludicrous to observe the various circumstances of us officers, as, smoking cigars and occasionally shivering, we stood around and watched the fire giving more smoke than heat. It was tedious work waiting for orders. We were anxious to be put in motion. If it were only up to circulate the blood, for both horses and men were shaking with cold.” This is from a recent book by, called Waterloo, by Bernard Cornwell, and it describes conditions at the battlefield of the battle of Waterloo, which, by the way, in June happened 200 years ago. These are the kinds of stories that you’re trying to capture like this for historians to look at. Fifty and one hundred and maybe two hundred years from now. Some final tips. Make sure your batteries fully charged, and the best thing is to keep your camera plugged in at all times so you don’t have to worry about it. Make sure you check your camera for no indexing before starting. Do a very thorough sound check. No sound, no interview. Thirty, ninety minutes. Some veterans have a tough time making it to 30, so be ready and you’ll have that reel number that will put you up against that limit of 90 minutes. Keep the camera in the upper face and shoulder area, and, if they have to stop, if they get emotional, just stop the camera and just resume the interview as soon as they’ve recovered. And, finally, the paperwork, the release form, the biographical data form, and all that stuff you’ve got to do in order to submit it. Some final steps, and then if you have any other questions and you want to contact me about our experiences with Johanns and Fischer, there’s my contact information. You can also call the VHP folks here, they’ll know it. Be happy to talk to you about it. Again, I think you’ll find this to be a very, very rewarding experience, and you’ll find a lot of good comments coming back to your Codale members office if you get engaged with the Veteran History Project. Thanks for having me here today. > Bob Patrick: Thank you so much. Certainly, the voice of experience of someone who’s been involved with this project. A lot of what Roger gave you is the type of training that we encourage everyone to get. And when we’re talking about training, I want to recognize someone who’s with us today. Megan Daly, I know you’re back there. Megan Daly, I know you’re right here. [Laughs] Megan, would you please stand. Megan is the director of senate training and education office, and, in the last few months, has been very active with us and getting the, doing some training sessions both teleconferencing as well as some training here in Washington with folks of the staff that’s here at the senate and also some folks back in the state. First of all, thank you, Megan, for doing that for us. But it has been very valuable to have that working through her office. I encourage you on the staff side, on the house side, to maybe get with who does that for you and, perhaps, encourage us to come over and do some of the training with them as well. But, Megan, thanks very much for all you’ve done. [Inaudible] Now, talking about collaboration. I mentioned we’ve been doing collaboration with different organizations, and I’d like to introduce Caitlin Green who’s with the National Endowment for the Humanities to talk about a recent collaboration we’ve done with them. Caitlin? You can come around this way. They’re steps. > Caitlin Green: Good morning, everyone. Thanks, Bob. I’m here today representing the National Endowment for the Humanities. For a federal agency, we are a grant making agency, primarily, but we also fund state humanities councils to do programming at the local level. Backing up a bit, I’m here today because Monica and the Veterans History Project team reached out to us a few months ago after our new chairman took office. He — our chairman’s name is “Bro” Adams, and he was previously the president of Colby College in Maine. But when he was a young student in the 1960’s, he left college briefly to serve in Vietnam, and then when he came back he had an experience that we’ve heard many times of reintegrating into the college classroom and learning how to compare his experiences to what he was experiencing back home. So, Monica and the Veterans History Project team approached us at NEH and asked if the chairman would be willing to sit down and share his story, and, of course, he was extremely excited to contribute to this fantastic collection and will be sitting down with Bob to record his oral history next week. We thought, why not continue this beyond the chairman’s recording and connect the two networks that NEH and the Veterans History Project have. We work in similar spheres as federal cultural agencies, however, there are different constituents we serve, so we thought this would be a good opportunity to collaborate and bring our worlds together. NEH has been engaged in an initiative to serve veterans over the past year and a half. Although, we funded projects that connect veterans with the humanities. Going back further, I have materials in the back about some of our projects. One of the notable pieces of our standing together initiative is that the state humanities councils we fund have each taken on a special local project connected to veteran’s experiences. For example, in Arkansas, the humanity’s council is funding a course at a local college for veterans who are reintegrated into the classroom. In Rhode Island, the council put on performances of the ancient Greek drama, Ajax, and led discussions for veterans and civilians in the community to discuss how ancient Greek drama relates to the veteran’s experience today. So, soon after the chairman sits down to record his interview, we’re going to send encouragements out to congressional offices, NEH grantees, state humanities councils to join NEH and VHP in a national recording history week during Memorial Day week. Of course we know everyone has busy schedules, so if you can’t participate in record history week, you are also welcomed to contribute to the collection any time and participate and collaborate with NEH and the VHP. One other reason we’re doing this, Roger touched on this a little bit, is that we see this as the collection of the future, for future historians to access. NEH is part of Standing Together, recently awarded funding to Ken Burns to produce a documentary on the Vietnam War, and Monica has told me that he, that his staff has been in the collection looking at different pieces. We at NEH fund projects like Ken Burns’ documentary fairly frequently, so we hope that this archive will exist for future NEH grantees to access as they’re compiling the histories of the recent conflicts in the future. So, I will be around to connect anyone. We have materials around, and thank you. > Bob Patrick: Thank you, Caitlin. I should also point out I’m very excited about interviewing Chairman Adams next week, and we’re also in the process of interviewing members of congress who are veterans as well. And we’ve sent some notice out to some of the offices encouraging your bosses to do their interviews and if you’d like to talk to me about that, we can certainly talk to you about that after we’re done here. I’d like to draw your attention, too, as you leave here, you look in the back. If you haven’t already, you see our group of, a group of maps. I’ve, kiddingly, been calling them “Spread AT&T and Verizon”, [Laughs] but, it shows the growth of this project over the last, I think it goes back to 2008 and you can kind of take a look. We have done interviews in every state in the union and every congressional district and you kind of see where your, where your district or where your state stands. As I said, it’s continuing to grow, but that gives you an idea of where we are today. I’d also, now, at this point, I’d like to call forward one of the VHP staff members, Andrew Huber, who’s here to speak to you a little bit about some of the media things and some of the more recent developments we have in the project to help you. Andrew? > Andrew Huber: So, earlier, Bob was saying that there’s a veteran in everyone’s life, and it really is true. My father was an Air Force counterintelligence agent during the Cold War. His story’s actually archived in VHP. My grandfather was a PT boat commander in World War II, and my great grandfather was in World War I. And it’s not quite as cool as Bob’s dog tags, but I am actually wearing my great grandfather’s cufflinks today. Even though I doubt he wore them in the trenches. [Laughs] So, you can see that we’re all really passionate about history and the veterans that we interact with here at VHP, and I know that you’ll find that once you start working with us. You’ll find that your constituents are just as passionate about the veterans in their lives. And the way we connect with a lot of your constituents and a lot of the people who worked with our project is social media, and there are several things that we do and several ways that we can help you connect to your constituents with us and with the veterans in their lives. So, one of the things we have is, obviously, you all recognize Facebook and you all recognize YouTube. On Facebook, we do, basically, things to drive traffic to our blogs and our assess feeds and to just kind of raise general awareness of our project. We highlight pictures from our collections with short little snippets of stories to kind of get the readers interest and get them to come to our website and to, in your case, to come to our website and then call your office. YouTube, we have our educational videos. We have a 15 minute short documentary featuring Ken Burns that shows you exactly how to participate in the project and how you can get involved and actually start doing interviews of your own. We also have our blog. This is where we go a little more in depth in our collections. We’ll usually highlight one, two, or three different veterans from our collections for each blog post. Maybe connect them with a current event or have a theme. Over the holidays, we had a great series of soldiers who were missing home or traveling home because, you know, we all know that everyone wants to be home for the holidays. But this is where we go a little more in depth into things. We get some great traffic on there. People love the stories. You know, just a really good way to show the human aspect of our collections. And that’s what we do. So, what I’m here to do is to tell you what we can do for you and what you can do for us and what you can do for your constituents. Hopefully, you can all see that the examples over here. Hopefully, you can read them. So, I’ve got a collection of things that other offices have done to interact with us. Some Tweets, some Facebook posts, and some other things. But the first and probably easiest thing you can do is just put a link to us on your website. I know most of the representatives and senators pages have veteran’s affairs sections or, you know, something about veterans in their issues section, and it’s really easy just to go in and put a link www.loc.gov/vets. Maybe a little paragraph about what we do, what we, you know, why our project’s important. It’s entirely up to you, and I’m going to get to the level of involvement in just a bit. The other thing you can do is share our posts on social, on your own social media. You can see on the Facebook one, that’s a direct link to one of our collections. You can see on the Twitter ones, some of them just kind of say, you know, like, for instance, the one from Senator Joe Manchin, “To honor the service of our veterans, help the Library of Congress with the Veterans History Project,” and then our link to our website. Or they get sometimes a little bit more specific. If they’re announcing an actual event that they’re doing with the VHP like Joe Donnelly, “Columbus veterans: Joe’s staff will host a Veterans History Project event at Greentree at Westwood next Wednesday,” and then, you know, the others ones that are just kind of linking to one of our collections, like Tim Canes saying, “Honored to interview John Nafoyantano, former USMC Corporal for the Veterans History Project. Watch the interview here.” So, there are a lot of different ways that you can kind of share what we’re doing, and you can also do things like create your own posts. We have several different things that we can do to help you create your own posts. We can give you links to collections, we can give you photographs, and we also have two public service announcements preprepared that we can give you the source files for. You can make bumpers for yourselves. And if I can get the help of the guy in the back, can we please show those two PSA’s? Just as an example. > From the World Wars, to Korea, Vietnam, to the Persian Gulf, Afghanistan, and Iraq. They saw what few others ever saw. But many veterans don’t talk about their experiences. It may be because you’ve never asked. Learn what you can’t always find in the history books. Interview or contribute materials from the veteran in your community for the Library of Congress Veterans History Project. Download a field kit from our website to find how you can play a role in preserving history. > Andrew Huber: So that’s the 30 second. And the 60 second one should be coming up any minute now. > From the World Wars, to Korea, Vietnam, to the Persian Gulf, Afghanistan, and Iraq. They saw what few others ever saw. But many veterans don’t talk about their experiences. It may be because you’ve never asked. Learn what you can’t always find in the history books. Interview a U.S. veteran in your community and submit their audio or video interview to the Library of Congress Veterans History Project or share those stories by contributing their original photos, letters, or military documents. Participate so that future generations may hear directly from those who served and better understand the realities of war. Download a field kit from our website and find out how you can play a role in preserving history. > Andrew Huber: So as you can see, we’ve got those videos for you. We’ve got our YouTube videos. We’ve got our Ken Burns video. We’ve got collections. We’ve got photographs. We’ve got no shortage of material that you can use to promote VHP on social media, and the big question though is why should you care? You know, yes, you’re helping us very much so, but you’re also helping yourself. You can connect our events to things in your district if you’re doing a VHP event or if it’s a holiday like Memorial Day or Veteran’s Day. And it connects you to your district because, as you can see on here, people actually know us and they like us and they want people to participate, so it’s probably a little too small for people in the back to read but this is a post by Corey Booker and it says, “This gentleman in loose shorts, he’s a 102 year old World War II veteran. He was in the Navy and fought in the Battle of Iwo Jima. He served on the USS Saratoga, where he was the oldest man on the ship at 31. It was such an honor to meet him today. Everyone in the room was both humbled and inspired by him and his continued spirit of service.” And only three posts down, you have someone posting saying, “Corey Booker, your team should interview him for the Library of Congress Veterans History Project.” [Laughs] It’s not a show. I promise. That was a normal regular constituent and right below that, we have two people, you know, who know us who agree with her and want the guy’s story archived. So, you know, your constituents, they do appreciate our service, and they want their veterans, their relative’s stories in there because it’s a point of pride for a lot of them. You know, this is something that future generations are going to look back on that they’ll see their family’s name, you know, in the Library of Congress. So, it really does connect you with the constituents, and it just, in general, improves your kind of visibility on social media. You know, gives you more things to post about, gives you more likes, give you more shares, and, you know, it’s very good for that sort of thing. And, oh, I’m sorry. I did forget. Another really, really easy thing is we’ve got a graphic available to put on your e-mail signature if you want to do that as well. So, if you’re interested, if you think this is something that would benefit you in your office, VHP staff are absolutely glad to come over and do, as Bob said, we could do a 15 minute briefing. Glad to tell you exactly how you can integrate social media into your own platforms. At your convenience, just either drop your business card in the fish bowl outside or find me in the back once this is done, and I’ll be glad to come over. So thank you very much, and I really do hope you’ll consider adding VHP social media. > Bob Patrick: That concludes our briefing. We got some time for anyone to have any questions, I’ll be glad to take them right now of if you’d like to discuss it with us after, we can do that as well. Anyone have a question? Okay. If you’re interested in the flyover opportunity, check with Monica in the back, and she’ll sign you up if that’s what you want to do. Explain to you what’s going to happen. Again, we appreciate you coming here today. Have a safe weekend and don’t forget VHP. Thanks a lot. > This has been a presentation of the Library of Congress. Visit us at loc.gov.